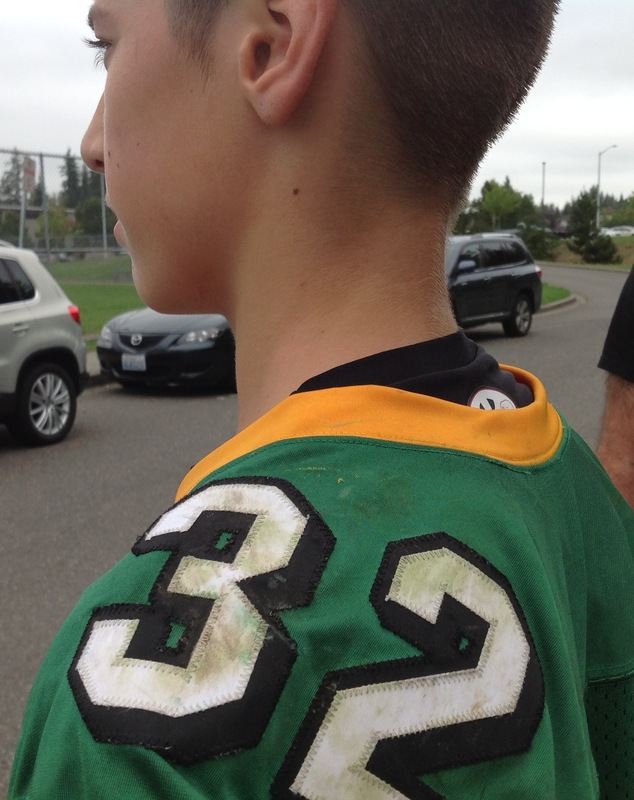 A week ago, after his second football game of the season, my thirteen-year-old son climbed into the back seat of his grandparents’ car and sat down next to me. My parents came from out-of-town to watch him play, and he played his heart out for nearly every minute of the game. Fifteen minutes or so in to the forty-five minute ride home from the field, he shot me a panicky glance and told me in a quiet voice “not to freak out”, but that everything looked “funny and blurry”. A few minutes later he became nauseous, and by the time we pulled up to the curb in front of our house he said he had headache and told me he needed to go to the doctor, an unusual request coming from him. At the same time that he and I were sitting there in front of my house in the back seat of my parents’ car quietly negotiating the increasingly urgent need to get him to a doctor, my mother’s cell phone rang. It was my uncle on the line – my father’s brother. He was calling to deliver the sad news that my aunt had died. We knew this was coming as she was at the end of a struggle with cancer that had gone on for several years, but still, it was shocking. The intersection of the phone call with the unfolding drama of my son’s brain injury was odd and scary, and it punctuated again for me the ever-present but easily forgotten reality that life can change in the blink of an eye. Everyone lives with this, but we forget and deny as protective mechanisms because it would be impossible to live peacefully otherwise. I took my son to the nearest hospital in my neighborhood which conveniently happens to be a world-class children’s hospital. There, a very nice woman (who looked awfully young to be a real doctor) diagnosed him with a concussion. They observed him there for a while, performed a neurological exam which was thankfully normal, treated his nausea and headache until it had subsided to the doctor’s satisfaction, and prescribed both physical and cognitive rest for my boy. This was disappointing because of the promise of an exciting football season ahead, and because he really loves to play. Last year he broke his arm the first day out in the mountains snowboarding. After six weeks in a cast, he (cautiously) returned to the slopes. It was frustrating and it delayed his snowboarding season, but it didn’t ruin it. Fractured arm bones knit back together stronger for the most part, and he could choose the runs and jumps he would take until he was healed, unlike on the football field where he has less control of the action and variables. A concussion is something different from a broken arm. There is a lot of new information and emphasis on the danger of concussions and returning to sports, but still, a brain injury is somewhat mysterious and unseen. He is clearly recovering and we will take him to a doctor who specializes in sports concussions for follow-up and evaluation, but I do not know how we can allow him to go back on the football field this season. He is very competitive and he admitted to me that during that one game alone he was hit in the head “at least 20 times”. Sure, there’s baseball and basketball and of course academics – plenty of other things to do, but football has been his world for the past couple of months. At the same time, while dealing with this, I’ve thought of my cousins and my uncle and the death of my aunt, and I know what a true game-changer and loss her death is to our family. This obviously overshadows my son’s concussion, and yet his injury is also a loss in our world, and something for him to reckon with. At the beginning of the school year, my son and I talked a lot about the importance of his studies, school attendance, punctuality and all the other things that are important for him to have under his belt so he can be an effective and successful human being. He is thinking about which high school he’d like to attend, and he is thinking ahead to college. In his repertoire of role models are two older siblings. His twenty-one-year-old brother, my oldest child, struggled hard with school for years and eventually dropped out of high school. He has not yet returned to any kind of formal schooling. He is clearly on his own path, he’s calling the shots and dealing with the consequences, which as he gets older becomes both easier and more serious for him. His older sister is eighteen and a senior at one of Seattle’s more rigorous college prep schools. She has over a 4.0 GPA, has played varsity softball, volunteered in nursing homes and soup kitchens, and for the past year has held down a part-time job in grocery store. She is working her way through the college application process. At thirteen, my youngest son occasionally muses out loud about what it will be like when he grows up and has three children of his own and a job and a wife, as if this path is the most natural thing in the world to him. My daughter talks of going to medical school, and my oldest child lives from day-to-day and feels his life changing and coming together, he assures me, in a “positive” way. Of course I worry about them all, yet I respect their unique struggles and ambitions and their vastly different personalities and paths. I try not to let my world view and ideas of who they are or who I think they SHOULD be color my interactions with them too much. It helps that I am an optimist. My own view of life is chiefly dominated by the idea that anyone can do anything they set their mind to do. I am American. I grew up middle class, white and privileged. At the same time, I have experienced my share of heartache and obstacles, and I understand that sometimes no matter how hard a person tries, the challenges are overwhelming and insurmountable. And sometimes, despite our best intentions, our actions come with severe, if not final consequences. It seems there has been an overriding ethos among my parent peers that we can control our children’s destinies by giving them “advantages” – fancy educations, piano lessons, tutors, counseling, rides around town, intact families, or maybe the right sporting gear. Of course there is nothing wrong with any of these things individually. They are all in fact lovely things to give one’s children. It is simply that we have no choice ultimately but to respect that our children are human beings on their own collision-course with destiny. Each of my children has different challenges and obstacles to deal with. I resist the idea that because my daughter is on a more conventional path, that her challenges are “easier” or “better”. I do not know what the future holds for her OR for her brothers. I had a friend once who when we were young became very ill with a potentially fatal disease. During her recovery, I asked her if she was resentful or bitter that others in her circle of friends were not going through the hell that she was, and in fact seemed to be living through some of the best days of our lives. Her answer was that she was not resentful at all. She made it clear that her own dire situation had made her aware that each of us would one day face our own such challenges, perhaps sooner than we knew. Her time was now, but she recognized that our time would come too. Those were prophetic and wise words for a young person to speak and understand, and they have stuck with me through the years. I take nothing for granted as a parent, and I do not pretend to have answers, just unwavering love to give them as they juke and dodge their way through their lives and sometimes take the hits in their most vulnerable places. This entry was posted in coming of age, family, grieving, love, parenting, spirituality, teenagers and tagged concussion, death, family, football, grief, parenting, spirituality, teenagers. Bookmark the permalink. With thoughts to all your family as you deal with your son’s concussion fallout; and your aunt’s death. This is scary stuff. My husband is a neurosurgeon, and we opted not to let our sons play football because of the injuries he saw. That decision is not right for all kids, or all parents, but I went along, because I knew he’d seen some very traumatic things… in very young people. He says that it’s critical that a kid with a concussion not return to the game until 2 weeks after ALL symptoms have disappeared, but the fact that your boy said he’s been hit 20x is such scary stuff. Telling our son that though he was good at football, and wanted to play, it would likely not be his life path… helped him move past football and pick another dangerous thing to do. He’s our risk taker, so we only removed one hurdle. But that helped me sleep better… for a while. 😉 Sorry for the loss of your aunt, and the scare with your boy. Mom’s hearts are covered with scars, I think. Indeed covered with scars…laughing at your comment about how leaving football behind helped your son pick another dangerous thing to do. I’m scratching my head saying to him “how ’bout you play La Crosse instead? boxing? mountain climbing? flinging yourself out of an airplane? ” sigh. We went in today and had a visit with a rehab doc and a very good neuropsychologist. He is not cleared for any contact sports and I am okay with that. My husband works with this a lot… definitely err on the side of cautious. There are certainly safer sports than football, but there are more dangerous as well. It’s all a super balancing act. Ultimately, we all want our kids to explore and expand, but we want them safe and whole as well. Not easy. You have my condolance for your families loss. This was such a thoughtful musing about how we come through childhood and parenthood. Both my sons played “safe” sports, yet they managed to acquire injuries. I wonder, how much we can steer them? You have a lovely and well rounded view of parenthood and a role model to all future mothers….its a tough gig and you always do everything you can to the best of your abilities but ultimately it is their life..you just hope you have planted enough seeds that will hopefully sprout. Am relieved that this tale has a … actually, you’re not sure about the ending yet. But the interim’s good, -ish, so whew! – It’s good you mentioned this because it’s a little known fact. >he admitted to me that during that one game alone he was hit in the head “at least 20 times”. – Yikes. I can only imagine what you felt when you heard that. >which as he gets older becomes both easier and more serious for him. >And sometimes, despite our best intentions, our actions come with severe, if not final consequences. And somehow, even though you say “final”, it doesn’t feel like ‘The End’. Which is a good attitude to have when faced with something like that. >perhaps most importantly by modeling these skills ourselves. – And how commonly ignored by adults! >It is simply that we have no choice ultimately but to respect that our children are human beings on their own collision-course with destiny. – This reminds me of my (weekly) chat that I had with my chaplain earlier today after Mass. Father has known for me 5 years now, and he knows me as, uh, a ‘good’ kid from a ‘good’ family. Yesterday, I shared with him some of my behaviour from my mid 20s to my early 30s because it was connected to the homily. “I became arrogant. I don’t know how. I wasn’t like that when I was younger and my parents aren’t like that either. In fact, as you know, they are very kind, especially to the underprivileged, the lonely and the marginalised. But during those years (mid 20s to my early 30s), I did not notice those people at all. I wasn’t rude to them, just unaware. So what I’m trying to say, Chris, is despite doing your best as a parent, the children *might* go off into the deep end. Hopefully, only for a short time. – Ah, that’s all that children need, Chris, that’s ALL. Said a prayer for your aunt. *If he happens to read this, that moniker is only because he’s the youngest.